Is Your Child Stuttering? What is Normal and When Should You Be Concerned? One of my children’s teacher always started unexpected calls from the school with “everything is fine,” if indeed the call was not of an urgent nature. Let me start by easing your minds right now with the eye-opening statistic that 75% of children who show signs of early stuttering will grow out of it by late childhood. Stuttering is a normal part of a child’s development. Typically, between the ages of 2-5, a child will show “developmental disfluency”. This can come with the increased complexity of their communication skills and from their entire system being stressed from developing other large skillsets such as walking, potty training or otherwise. You might also recognize this anomaly when your child is particularly excited to tell you something and their brains just get ahead of their mouths. Interjections such as um, like, uh, well, etc. Do not call attention to it. Wait patiently while your child gets out what they are trying to tell you. If your child begins to exhibit avoidance for fear of stuttering, encourage him or her to talk to regain confidence. When should you seek help from a speech-therapist for stuttering in your child? If your child avoids talking or saying certain words or sounds. 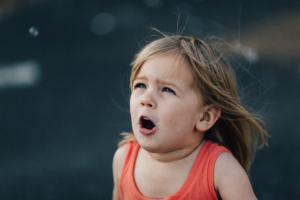 If your child shows signs of a struggle to talk, such as tension or grimaces. If your child is concerned about his/her own speaking ability. If your child stutters for more than 6 months and stutters frequently during the daytime.